New Delhi: The inability of Bollywoodâs biggest stars to guarantee box office returns lately has led filmmakers to rely on fresh faces for their projects. Earlier this year, Salman Khanâs Eid release Race 3 ended up with underwhelming theatrical box office collections of â¹166 crore, while Kamal Haasanâs spy thriller Vishwaroopam II collected less than â¹2 crore on its first day. Even superstar Rajinikanthâs Kaala made only â¹97.8 crore, while last year, Shah Rukh Khanâs Jab Harry Met Sejal collected â¹62 crore. Little surprise then, last week, Jab Harry Met Sejal director Imtiaz Ali released a romantic tragedy called Laila Majnu featuring new faces. After the massive failure of his period drama Rangoon, starring Saif Ali Khan, Shahid Kapoor and Kangana Ranaut, last year, Vishal Bhardwaj has a comedy drama titled Pataakha with relatively unknown faces scheduled to release at the end of September. Even as he readies his magnum opus Zero with Shah Rukh Khan, film-maker Aanand L. Raiâs Colour Yellow Productions is backing a horror flick called Tumbad that is already touring the festival circuit. Without attributing the trend to fading star power, film-makers say there is science to backing newcomers. That said, Ali added that filmmakers like him or Bhardwaj are working for the joy of making movies and telling stories in a way that is economically viable. The idea is to write a film and then see if a star should be approached and not the other way round. To be sure, a filmâs lacklustre performance cannot be attributed entirely to stars, who often get good enough openings. 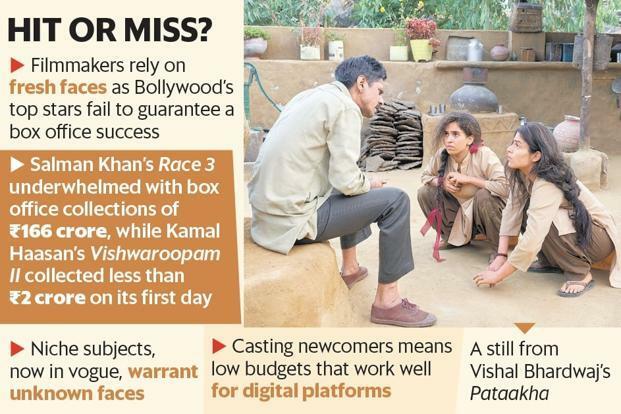 âThe basic job of the star is to attract audiences to cinemas, but then itâs a matter of what content they have chosen,â said Atul Mohan, editor of trade magazine Complete Cinema, referring to the fact that fading star power at the box office may have to do with the actors not choosing scripts that satisfy or please fans. < p>The choice of actors also depends on the kind of film youâre making. Raiâs Colour Yellow that has found success in smaller films such as Newton and Happy Bhag Jayegi, believes itâs most important for actors to fit their parts. Bhushan Kumar, chairman and managing director at T-Series said there are certain subjects which demand fresh faces just as there are subjects to which an established actor can do greater justice. âWhen we de cide to back a project with newcomers, before they go on the floors weâve definitely gauged their ability through workshops. Plus, there are creative minds overseeing the project, like in the case of Tuesdays and Fridays, co-produced by T-Series and Bhansali Productions, it is Sanjay Leela Bhansali who is backing it,â Kumar said. Tuesdays and Fridays, that features newcomers like Anmol Thakeria Dhillon and Jhatalekha Malhotra is scheduled for release next year. To be sure, the newly emerging avenue of digital video streaming has added to the inherent charm of small, non-big star cast films that can find an audience beyond the movie theatre. For example, though Rajkummar Rao-starrer Stree has set the cash registers ringing, the Rs. 20 crore budget film had already recovered its investment through digital and other rights. âI think the advent of digital streaming has become a big thing for smaller and smartly budgeted films because it gives a new avenue to them so th ey donât have to jostle with other bigger star cast films at the theatrical box office,â Ali said.